Creative story telling through mind mapping! Today I had great fun with my four and six year old boys (my two year old was also helping) in creating a story using a mind map. The whole idea came from an inspiration I had earlier from the ThinkBuzan newsletter, which encouraged parents to do fun activities with iMindMap 5, one of them being creating a story. When I read their Blog post I though it was a lovely idea, but with none of my boys being a confident writer I though it wouldn’t really apply to us. Then, I started thinking straight and realised that in mind mapping little words and many images mean greated imaginative and associative power, especially with iMindMap 5, where all you need to do to add your images is Google for what you are looking for, copy and paste into your branch. And that’s exactly what we did! 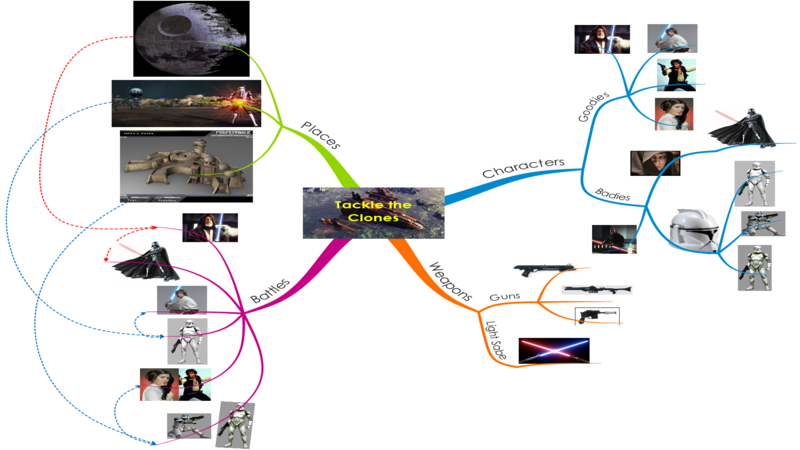 The rest was easy, because all we had to do was to Google the images the boys were choosing to make their story and paste them in the relevant branches, as you can see from the mind map we created below. With the battles I asked the boys to decide who was fighting who and in what places. Basically they were beginning to storyboard their story using the power of associations that this mind map gave them. We came up with some conventions. The double arrows show who is fighting in our story, but if the arrows are red, it means the villain wins, and if the arrows are blue, the heroes are prevailing 🙂 simple but effective. The battles will take place in the places linked to each battle by the dotted arrows! As my first attempt to mind map with my little boys I was extremely pleased to see such interest and creativity going on. Mind mapping truly is the “Swiss Knife of the brain” as Tony Buzan often refers to, and I will try to transfer my passion for mind mapping to my children more actively in the future. iMindMap 5 is a really powerful tool for mind mapping, because it allows anyone, even bad Artists like me to create very visual and effective mind maps in very little time. A feature that we will add in the next few days to our Mind Map Story is a narration of the story following branches and by adding audio comments, another great feature in iMindMap 5. If you want to download my boys’ mind map you can find it on my Biggerplate account.